The final flight of steps of this ancient staircase led up to the monastery. They seemed to rise straight up into the sky. Perhaps in the monks’ minds, this was the stairway to Heaven, or at least Heaven on Earth. 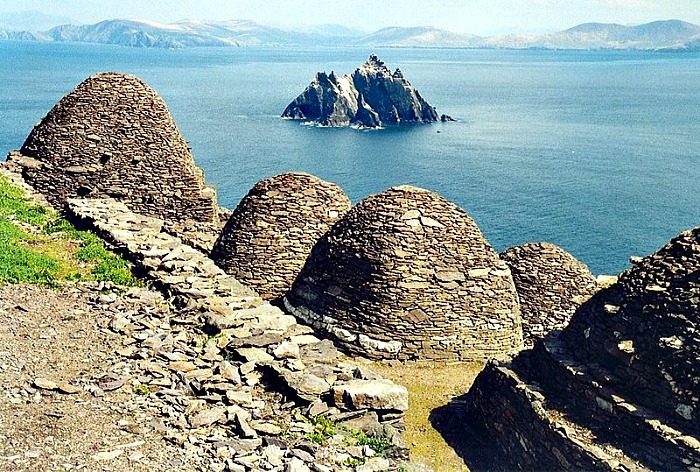 500 YEARS AGO, a handful of courageous monks chose to take up residence on Skellig Michael, an inhospitable rock 12 kilometres off the Iveragh Peninsula on the Kerry coast. This monastic settlement is thought to have been founded in the sixth century by Saint Fionam The exact date is uncertain, although it was mentioned many times in old Irish writing. The island got its present name later - possibly in the 11th century -around the same time as Saint Michael’s church was built. Saint Michael was the patron saint of high places and the guardian against the powers of darkness. In 1996, UNESCO added Skellig Michael to its World Heritage list, and it is said to be one of the world’s finest examples of an early Christian monastery, making it a popular tourist destination — when the weather obliges. The sea crossing between the mainland and the island can be notoriously rough, so for two days I waited as the rain lashed down and white horses ripped across Ballinskelligs Bay. “Far too dangerous” Michael the boat owner, said. Finally the wind dropped and the sea calmed. In the picturesque harbour of Portmagee, I joined skipper Pat, his mate Des, and eleven other passengers. We piled into the sturdily built Ursula and cast off. If these were good navigating conditions, then I was relieved to have the luxury of a high-powered engine and an experienced captain. THE 45-MINUTE crossing was relatively dramatic, but the sight of the two jagged pyramids of rock rising 200 metres straight up out of the sea, stole the show. To call the To call the Skelligs “islands” is a misnomer, the Irish word sceilg, meaning a rock, is far more appropriate. Firstly, we circled Little Skellig, the smaller island of the two. From a distance, it appeared to be splattered with white paint. This was soon explained by the 27,000 pairs of nesting birds –the second largest gannet colony in the world - clinging to every last ledge available. Landing is not permitted here, but as we drew closer their cries became deafening. The mild climate and warm seas created by the Gulf Stream also attracts many other species of gulls and cormorants, and quite often sharks and dolphins. “Look! Seals!” Des shouted above the din. Pat turned the boat so we could photograph the seal colony. Some basked in the sun and others slithered off the rocks into the sea. All around us, gannets displayed their fishing skills by diving into the sea from a great height. Gannets have binocular-like vision, reinforced skulls and air sacs in their chest and face to soften the impact,’ we were told. This, together with their savage beaks, meant they nearly always struck lucky. Elsewhere, diminutive stormy petrels darted above the water like swallows. FIVE MINUTES later, we pulled alongside the taller island of the two, Skellig Michael, at the main landing stage of Blind Man’s Cove. In their day, the monks made use of three alternative places to get ashore, depending on the vagaries of the weather. The other two are thought to be too treacherous for tourists to use. In the 1820s a concrete landing stage and a rough road, a feat of engineering in itself, were built, dug out from the sheer rock-face, to lead to the island’s two lighthouses. The upper lighthouse was soon discontinued, but the lower one still functions with a solar powered flashing light, vital for shipping today. As I leapt ashore, the gap between the heaving boat and the concrete steps gaped alarmingly. Once safely on firm ground, my legs still unsteady from the crossing, I breathed a sigh of relief. We walked up the rough road a short distance, passing by a noisy profusion of guillemots, kittiwakes and other gulls nesting only metres away. THEN I LOOKED upwards and gasped 544 steps, so I was told, I didn`t count, chiselled painstakingly by the monks all those centuries ago, rose in a perpendicular sweep above me. The few handrails at the start of the climb soon petered out and there were no guardrails to stop my fall it I lost my footing. Those who suffer from vertigo are advised, before leaving the mainland, to visit the Skelligs Experience Centre instead, back on level ground, in Portmagee. In fact, warning signs have been put up concerning potential dangers in the port before you board your boat and again on the island, as well as verbal advice, although it is really only common sense. DESPITE THIS, two people in our group panicked. “We can’t do it.” However, they were gently persuaded and given a helping hand by the young man who accompanied us on the boat charged with our safety. Perhaps they had read of the two fatalities that occurred in 2009. Although there was much to catch my eye as I climbed, I made sure of my footing before stopping to admire the view or photograph the bird life. Puffins were nesting right, beside our rook-hewn stairway, seemingly unperturbed by humans. They undoubtedly enjoyed centre stage, eager to pose for photos by crawling out of their burrows or crash landing at my feet. Their striped red bills and bright orange webbed feet only change colour for the breeding season. Living most of their life at sea, they move awkwardly on dry land; waddling about and sliding comically off rocks. Three-quarters of the way up, we reached “Christ’s Saddle,” a grassy spot and a good level place to catch my breath. For the penitents, living here was as much about survival as an attempt to get closer to God, and the monks grazed sheep and goats in this area to add to their diet. It is said that on their rare trips to the mainland the monks traded birds’ meat and goats’ milk for wine, which was miraculously plentiful for daily Mass. Gannets’ eggs and feathers were also a valuable trading commodity. HERBS TOO grow wild on the island. Scarlet pimpernel was useful for treating rheumatism and kidney and liver ailments, whilst sorrel and clover were used for soups and salads. The Skelligs were on the European sea route, so news, foods and other essentials were exchanged with passing ships. A glance over the cliff from Christ’s Saddle revealed another set of vertiginous steps carved out of the rock, an even steeper way up. Than those we climbed earlier, but it was well-sealed off from adventurous tourists. High up to my left, a stone oratory clung precariously to a rocky peak. If extra penance was required this served as solitary hermitage. On my right, the final flight of steps of this ancient staircase led up to the monastery. They seemed to rise straight up into the sky. Perhaps in the monks’ minds, this was the stairway to Heaven, or at least Heaven on Earth. THE MAIN MONASTIC site is perched on a terrace, levelled out by the monks. Looking out at the stunning view back to the mainland and over to Little Skellig, I shuddered to think what it would be like standing out in the open there in stormy weather. Ducking under a low portal into a larger enclosure, I passed a patch of ground where the monks once grew their vegetables. They must have bent their backs digging this rocky terrain. A few steps down was the main part of the settlement, which includes a church, two oratories, a cemetery marked with stone crosses and six beehive shaped cells. Although some renovation work has been carried out, these dry-stone huts are amazingly well preserved. Each stone was fitted meticulously together to survive the raging storms that blew in from the Atlantic. A group of caretakers live on the island during the summer, in two-week shifts, and one was ready to share her archaeological and historical knowledge with us and answer our questions. “I suppose root vegetables, like potatoes and carrots” I said. We believe they grew peas, beans, celery onions and parsnips too? She pointed over to Little Skellig and apart from the abundant fish supply, seal meat and seal skin would have been a much sought-after prize for the more intrepid Skellig hunters. Inside the ruin of St Michael’s Church, the gravestone of two children dates from the 19th century, when a community of four families lived here to run the two functioning lighthouses. The Callaghan family lost two boys, aged 2 and 4 – tragic yet hardly surprising in such a perilous environment. AS IF THE remoteness of the place and the harshness of their lifestyle were not enough, the monks had to contend with repeated Viking attacks during the eighth and ninth centuries. Undeterred, they clung to their rock, only abandoning this remote outpost in the 12th century after a prolonged period of particularly ferocious weather. They appear to have moved to Ballinskelligs on the mainland. 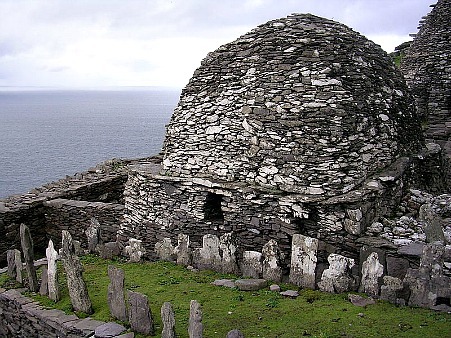 Then, in the 16th century, Skellig Michael became a pilgrimage destination again, in association with the Augustinian Abbey of Ballinskelligs, the ruins of which remain today. SINCE THE 1970s, tourists have had access to this place - ocean permitting — in the summer months. Now that the island is a World Heritage Site, numbers are limited in the interests of conservation. I did hear whispers that visits could be further restricted or banned altogether. Safety may well be an issue, but being such an important site, UNESCO also has to make sure tourism does not cause irreparable damage. Two hours later, Pat pulled the boat back alongside and Des offered a helping hand for us to clamber on board. As the island became smaller in the distance, there was a collective silence on the boat. It seemed the island had affected everyone in some inexplicable way. Unsurprising perhaps, as if you ask those who work here and are familiar with the place, they’ll all say the same, they are still affected by its magic. Whether it is the sense of history or some otherworldliness left behind by the monks, I cannot say. However, the crew of Star Wars must think so, because they are filming a scene for their next movie here, as I write. But for me, it was time to return to reality and leave this barren rock to the crashing of the waves and the screeching of the gulls.